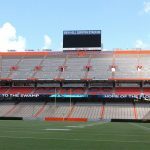 The 2018 Orange & Blue Debut spring game returns for Florida Gators football, and for the first time in a few years, it will again be held in its traditional slot on a Saturday afternoon. Florida has announced that the spring football game will be played on Saturday for the first time since 2015. The April 14 game will kick off at 3 p.m. ET, a couple hours later than it had begun in the past when held on Saturdays. The spring game will be one of 11 total Gators athletic events played on campus over a three-day span that weekend. Baseball and softball will each host three-game homestands, while lacrosse, tennis and track & field wll also be in action. Where can I get tickets for the 2018 Orange & Blue Debut? Is the game free for people who do not go to UF? Will you have to stand in line to get tickets that day? How will you know where to sit? Is it first come first serve? Will we have to show up at a certain time to be able to get in to see the game?